The Japanese leather knife is by far the most useful tool in my shop. These particular knives feature a chisel grind and are forged from Hitachi Super Blue (Aogami) steel. Like most Japanese tools, they look a bit crude by Western standards with their hand forged blades and simple Magnolia wood handles. Don’t let this simplicity fool you however; these knives are marvels of ingenuity. To make a cut, the bevel side or “Omote”, faces inward and the knife is held at such an angle that the bevel is perpendicular to the cutting surface. This may seem odd, as it would be much easier to judge the squareness if the flat side of the blade was making the cut, but it is much more ergonomic to hold the knife canted outward from your body. The use of a straight edge when cutting with a Japanese leather knife is usually not required. As one plunges the front edge of the knife into the leather, it becomes apparent that the rear edge hovers over the scribed cutting line. This acts as a sighting system and is astonishingly accurate. Not cutting against a straight edge saves a tremendous amount of time and fingertips. 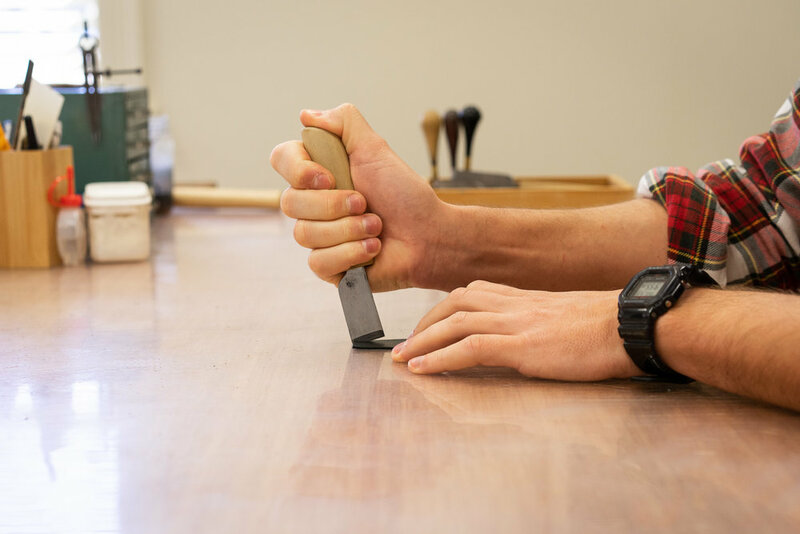 The backside of the blade, or “Ura”, is concave for the purpose of sharpening efficiency, but any portion of the knife that will be interacting with leather must be perfectly flat or the knife will steer away from the cutting line. Therefore one must remove the concavity for about 10mm up from the cutting edge. Once flattened, the backside can be polished to a mirror finish like the bevel. Both of these operations can are done on a waterstone.